Seven months after the I-Team revealed how New York refers injured workers to physicians who won’t help them, the state continues to operate a website that falsely lists dozens of doctors as workers’ compensation participants. “I couldn’t get help from anybody,” said George Akturk, an injured supermarket worker who tried to find an eye surgeon on the New York Workers’ Compensation health provider search website. Akturk, who injured his eye after falling off a ladder, said he combed the state’s website, but no ophthalmologist would agree to perform the macular pucker surgery he needed to restore his vision. In March, the I-Team called more than 60 ophthalmologists listed on the health provider search. More than two-thirds of attendants who answered the phones said their doctors would not treat injured workers who rely on workers’ comp insurance. The I-Team shared those results with New York’s workers’ compensation board but seven months later, most of those non-participating doctors are still listed as participants in the health provider search. Dozens of doctors who once accepted workers' compensation insurance have effectively dropped out of the program, but New York state continues to list them as participants, the I-Team has learned, leaving injured workers in the lurch as they try to find a provider. Chris Glorioso reports. Brian Keegan, a spokesman for the workers’ compensation board, did not answer specific questions about the false referrals, instead issuing a general statement. “The Board continuously reviews the list of providers to ensure that injured workers have access to needed care,” Keegan wrote. He added that injured workers who have trouble finding medical help can email WCBMedicalDirectorsOffice@wcb.ny.gov or call (800) 781-2362. Ultimately, George Akturk did find an eye surgeon. But he gives no thanks to Albany. “What you did for me was a miracle,” Akturk said. 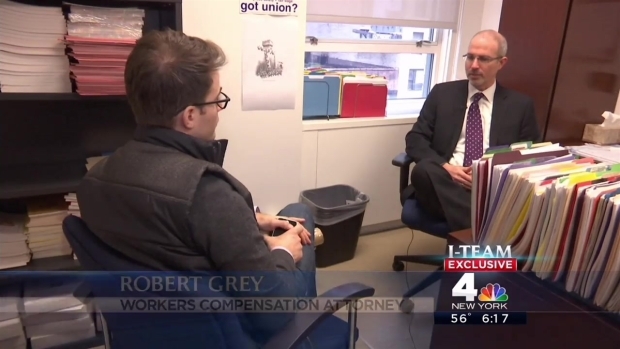 After reaching out to several experts on New York’s workers’ compensation program, the I-Team was able to connect Akturk with Dr. Benjamin Chang, an eye surgeon who operates out of Long Island and Manhattan. Chang is one of the few retina specialists who accepts workers' compensation in the New York City region. “I’m grateful that I’m able to help George,” Chang said. But Chang expressed worry that the state’s workers’ compensation website may have led his patient into a bureaucratic runaround.